ABOUT: The raccoon is probably best known for its mischievous-looking black face mask. It is usually a grizzled grey color with a tail marked by five to ten alternating black and brown rings. Body coloration can vary from white to black or brown. The raccoon is a nocturnal mammal. Total body and tail length for an adult averages 32 inches, and an adult can weigh between 9 and 18 lbs. BAD HABITS: The raccoon is an omnivore with a reputation for being clever and mischievous. With its opposable thumbs, the raccoon is a most formidable predator, and given the chance, will eat everything and destroy your pond as it removes fish, snails, frogs, and plants. ABOUT: The great blue heron has blue-grey wings and back, and a white head with a black cap and a long black plume. It has a long neck, streaked with white, rust-brown, and black, and a short tail. The beak is long and yellow and tapers to a point. Legs are long, and greenish-yellow. BAD HABITS: Herons generally migrate once it gets cold and they are looking for plump, slow moving fish to eat before they fly north! When hunting, the great blue heron wades slowly or stands statue-like, stalking fish and frogs in shallow water. The great blue heron can hunt day and night due to a high percentage of rod-type photo-receptors in its eyes that improve night vision. ABOUT: The kingfisher has a large head, long, sharp, pointed bill, short legs, and a stubby tail. It lives in woodland and wetland habitats near clear, fish-bearing waterways. The average size of a kingfisher is 11 to 15 inches, but these little guys can cause a lot of problems! BAD HABITS: The bird can be seen perching patiently on a branch and then diving into the water with a loud splash as it strikes its prey; usually small fish and frogs. For larger prey, it can been seen beating its prey to death by whipping it against a tree or by dropping it from the top of a tree. 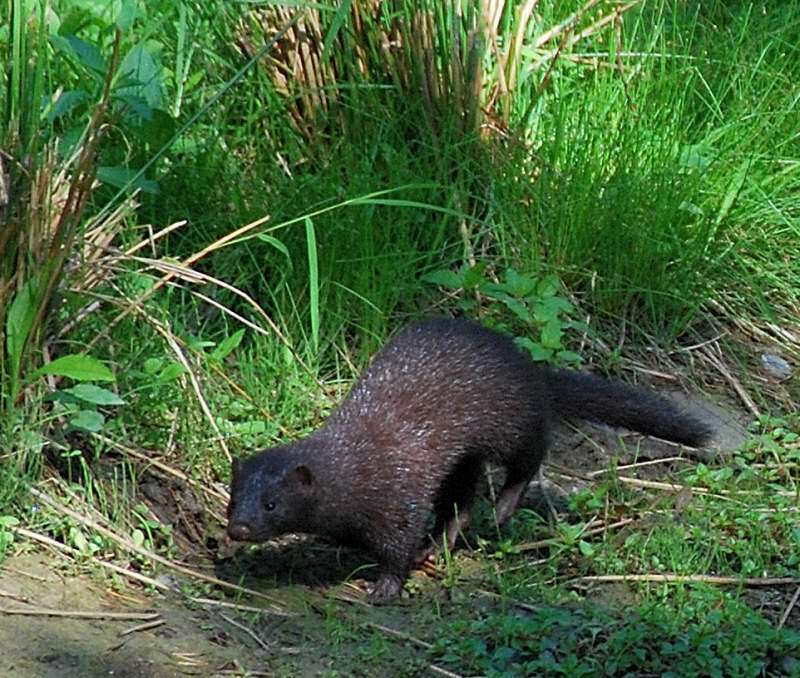 ABOUT: The mink is in the weasel family and can be found in streams, lakes, and ponds. A mink has a thick, soft, lustrous coat that varies from dark brown to black; oily guard hairs giving fur a glossy appearance; pale underside; white patch on lower lip; short legs; long neck and body; partially webbed feet; pointed face and small ears. A male will measure 19 to 24 inches and a female will measure 16 to 23 inches. BAD HABITS: A mink is a solitary, nocturnal animal that can be seen hunting at dawn and dusk. It is primarily carnivorous, eating small mammals, rodents, frogs, fish, crayfish, birds, eggs, insects, worms, and some plant matter. A mink will willingly swim under water and ice and can dive to depths of 15 to 18 feet. Koi and goldfish don’t stand a chance in a pond with a mink nearby. Unlike other predators, the mink will slaughter the entire fish collection and make a stock pile at the bottom of the pond. ABOUT: The garter snake is a harmless snake to humans and it bears live young. These reptiles range across North America and are able to adapt to various climatic areas and many habitats, from grasslands to marshes, in dry or wet regions. The common garter snake is green with red or yellow stripes running lengthwise, but there is a great variety in the color and patterning of different varieties of these snakes. BAD HABITS: This snake, like all snakes, is carnivorous and its diet includes almost any creature that they are capable of catching. A pond provides a smorgasbord of goodies, from frogs and tadpoles, to small fish, which they swallow whole. ABOUT: The muskrat is a fairly large rodent commonly found in the wetlands and waterways of North America. The entire body, with the exception of the tail and feet, is covered with a rich, waterproof layer of fur. Its color ranges from dark brown on the head and back to a light greyish-brown on the belly. A full-grown animal weighs on average about 2.2 lb. The length of the body from the tip of the nose to the end of the tail is usually about 19 inches. The tail is slender, flattened vertically, and up to about 8 inches long. Bulrushes, cattails, and horsetails provide both food and den building material for muskrats. The muskrat is well adapted to a semi-aquatic lifestyle. BAD HABITS: Although fully functional on land, it has evolved characteristics that make it at home in the water. A muskrat can do untold damage in a pond because it makes dens under the water by chewing through rubber liner. Most pests enter areas inhabited by people because they are in search of food and shelter – so the first & easiest way to protect your pond from predators is to make your home and yard less appealing to them in the first place! Keep your property free from overgrowth, tall grass and other hiding places. Don’t leave pet food or other animal feed outside (and store in air tight containers). Avoid attracting snakes by removing other food sources – like rodents. 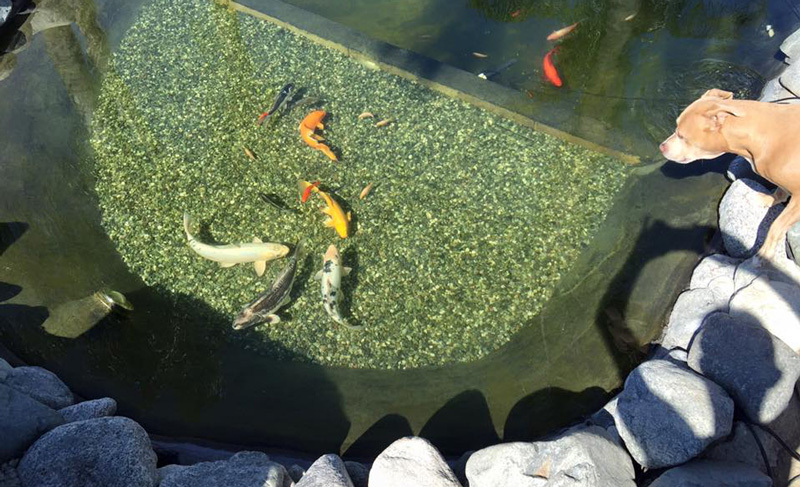 Different depths serve different purposes: If you are having fish, make sure there is a “deep-end” with at least a 3 foot depth to prevent predators from wading into the pond as well as giving the fish a place to hide. In addition to giving your fish somewhere to hide, adding a decoy like a floating alligator or even a heron “look alike” is a perfect way to prevent them from landing near your pond in the first place. If you are at wit’s end trying to protect your fish from predators, it might be time to consider adding a protective net over your entire pond. Pond nets are not the prettiest accessory for your pond and it can be a pain to feed & perform maintenance, but nets are the best way to prevent predators from entering your pond. 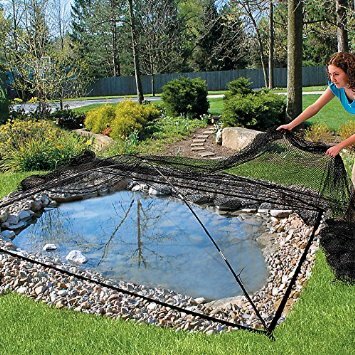 As an added benefit, pond nets can also help prevent debris from entering your pond. We recommend adding a length of drain pipe to the bottom of your pond in order to provide fish with a place to hide from feeding predators like herons. Adding pond plants like water lillies is another easy way to provide a lot of surface cover and shelter for fish to hide from predators. If you have mink, raccoons or muskrats on your property, the best method of prevention is to use traps to bait, capture and relocate the animals before they can cause problems for your pond. While not every raccoon or muskrat may have a taste for fish, minks are primarily fish eaters. So once a mink has found a food source on your property, there is no good way short of capturing or killing it to prevent it from eating everything in your pond! Tell us about your (positive) experiences! We have all heard the heartbreaking stories of pond predators eating prized fish, but we want to hear about your positive experiences chasing off pond predators. Share your story or techniques for preventing pond predators in the comments below! We lost 2 young koi from our first little pond to raccoons the first year. Then we built a bigger/better pond and covered it at night by lowering a mesh satellite dish over it at night. We still have all 13 of our fish. Raccoons have tried to get in but can’t. During the day, a garage door opener raises the satellite dish about 7 feet high. It shades the pond and keeps the herons from being able to see the pond. Even looks good! I removed the decoy and a friend gave me a heavier net and I used it. Have not lost any koi since netted the pond. Moral of the story Net Your Pond when unattended especially at night. Keep Living The Pond Life. Our solution to keep those pesky herons from eating our fish again was to string fishing line over the pond. Since our pond is next to our porch my husband took a 1×1 8 foot long board and attached it to our porch. He made two of them, the one at the bottom he put legs on it and drove them into the ground. He then put little cup hooks spaced about 1 inch apart on the two boards. I stayed at the porch and he at the bottom of the pond with fishing line and went from the porch to the bottom of the pond attaching it to each cup hook. We can still watch the fish because you really don’t notice the fishing line but we have not had any herons because they can’t get down between the fishing line. They fly over and keep going.